The Agua Fria High School Football coaching staff would like to extend a welcome to future Owl football players who want to prepare for their upcoming football season. Campers will learn football basics, position-specific techniques and participate in drills designed to lead to success on game day. 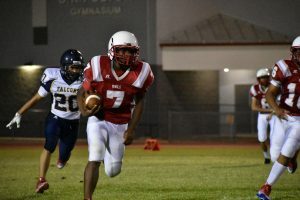 The camp staff will be made up of the Agua Fria Football coaches and varsity football players, who will lead campers through 4 evenings of fundamentals, football and fun. Please download the complete flyer here: AFHS Future Owls Football Camp Flyer 2019. Bring it with you signed on April 11. Email head freshman Coach Josh Jovanelly at jjovanelly@aguafria.org with any questions or to register in advance.